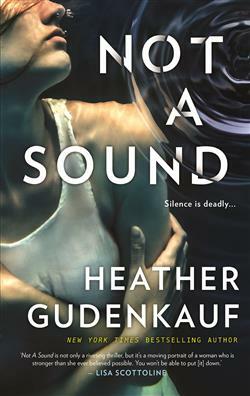 MY BOOK, THE MOVIE: Heather Gudenkauf's "Not A Sound"
Heather Gudenkauf's "Not A Sound"
Heather Gudenkauf is the New York Times and USA Today bestselling author of The Weight of Silence and These Things Hidden. It’s always fun to dream about one of my books being made into a movie. Not A Sound – the story of Amelia Winn, a nurse who loses her hearing, career and family due to a tragic accident. Two years later, with the help of her service dog, Stitch, she is finally getting her life back together when she discovers a body in the river near her home. Amelia is swept into the investigation and finds she is inextricably connected to the crime and in danger of being the next victim. Dreaming big these are the actors that I envision in the roles of the main characters of Not A Sound. Marlee Matlin as Amelia Winn, a former nurse, alcoholic, deafened as the result of a suspicious accident. She would absolutely be my top pick. It would be an absolute honor to have Ms. Matlin play the character of Amelia. I would also love to see Marlee Matlin direct the movie. Diego Lattenhoff, best known as Mike Faber from Homeland as Jake, police detective and Amelia’s best friend. Alec Baldwin as David Winn, Amelia’s long suffering ex-husband. Stanley Tucci as Dr. Huntley, Amelia’s new boss. Starring as himself - Stitch, Amelia’s service dog and loyal sidekick. Naomi Watts as Gwen Locke, a nurse and former co-worker to Amelia. John Turturro, as Peter, a quirky and odd bookseller who is obsessed with Gwen Locke. Coffee with a Canine: Heather Gudenkauf & Lolo. Jennifer Jaynes's "The Stranger Inside"
Andrew Pyper's "The Only Child"
Helene Stapinski's "Murder in Matera"
Wendy Webb's "The End of Temperance Dare"
Ryan Lobo's "Mr. Iyer Goes to War"
Lucinda Riley's "The Shadow Sister"
Jenni L. Walsh's "Becoming Bonnie"
William Christie's "A Single Spy"
Richard E. Ocejo's "Masters of Craft"
Stephen Kiernan's "The Baker's Secret"